The wintertime was made for snowy scenes and little towns, where one can enjoy white settings amidst the colors of the oncoming Holiday season. 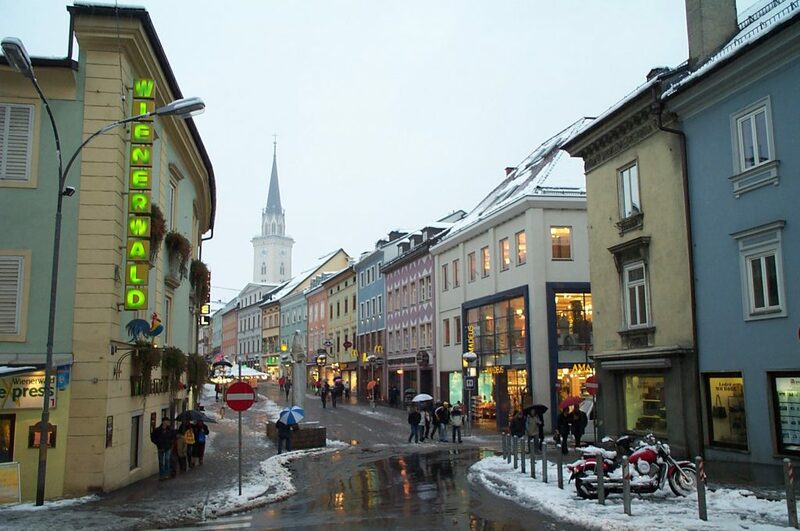 Such were the thoughts crossing my mind as I encountered an afternoon layover in the wonderful Carinthian town of Villach, Austria as I was on my way to Slovenia during a cold and snowy November day. Carrying my backpack, I ventured around the town for a couple hours while waiting for the next train to take me south. I was not disappointed. Villach, and its half-dozen boroughs, straddles the winding river Drau. Located in the flatlands among a series of steep Alpine mountain passes, it is a main attraction for skiiers seeking a place to relax and shop. The pastel rainbow of buildings on the main street above were inviting, and the numerous coffeehouses were ready to greet with a warm beverage. The village’s main street, shown in the first photograph, is typical among small Austrian towns. The main pedestrian walkway is bounded by tightly packed row buildings, each painted different colors. The tower in the distance was that of one of the city’s Catholic churches. Meanwhile, the side streets are built in a circle or semi-circle around the main street, as shown in the second photograph. Surrounding all this is the remnants of the old city wall, some of which is now just the outside wall of some downtown buildings. As this was a Friday afternoon, and the weather was tough, there weren’t a lot of people about yet. 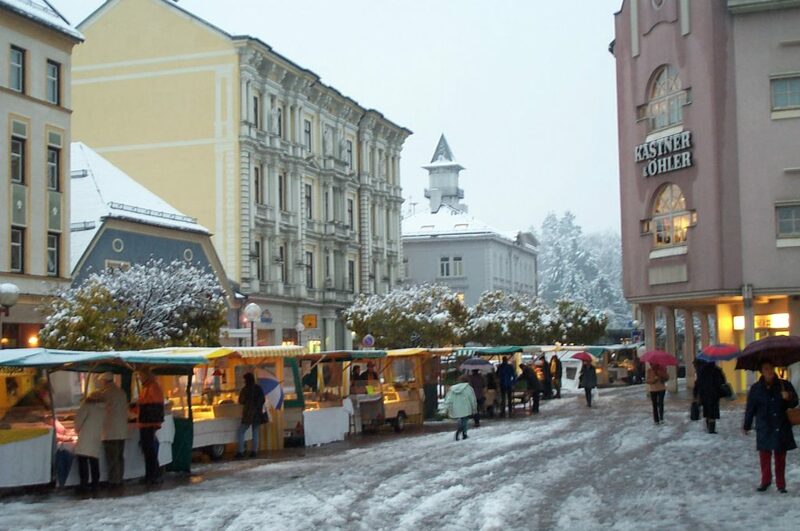 However, as the third photo shows, the daily outdoor market was set up at the far end of the main street in what I believed to be the main square. It was ready for people to buy their evening groceries — I recall that most of the booths sold traditional meats, sausages, and cheeses with a couple ethic booths such as Italian and Greek. 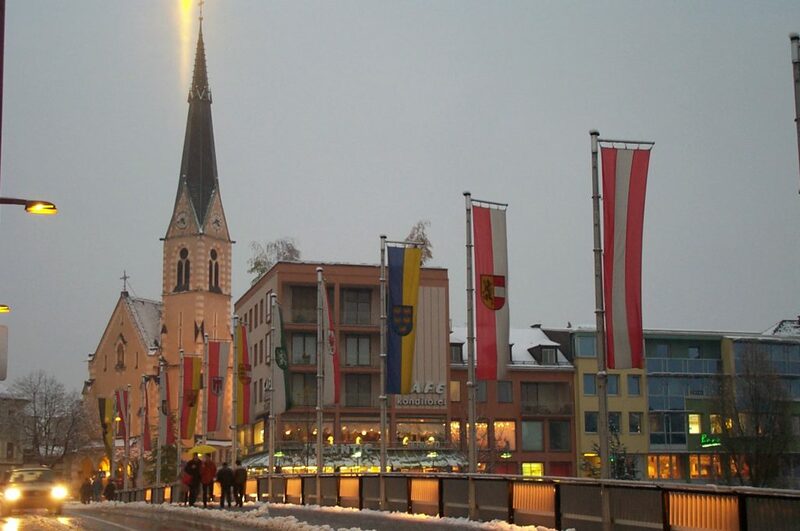 Villach has several bridges and churches gracing the town. The most photogenic of the churches was St. Nikolai, located on the city’s main bridge that is lined with the flags of the country, the state of Carinthia (Kärnten), and the various boroughs. It faces the train station, and stands on the opposite side of the river from the main street. By the way, the aura seen above the church is just a beam from a streetlamp… I planned the shot that way, thought it was neat. The larger Evangelical Church is positioned at the next bridge down, near the office of the local newspaper. Villach is probably better known as a summer stop, although there is plenty of skiing nearby. It is located on the way to Klagenfurt among a series of southern Austrian lakes, and the area surrounding the downtown contains numerous ponds and a castle. The “Congress Center” (or convention center) sits on one of these ponds, and ferry rides are available during the warmer months. Villach hosts numerous festivals and events — its English website lists summer festivals and annual music performances, for example. I sadly did not have time to visit the 14th century Burg Landskron (Castle) that overlooked the old city and incorporated some of the city’s original defenses. There is also a nearby Schloss Rosegg that I was not able to visit either that boasts a hedge maze and wildlife reserve. I am told that Villach is a popular spot for shoppers in between episodes of water skiing. 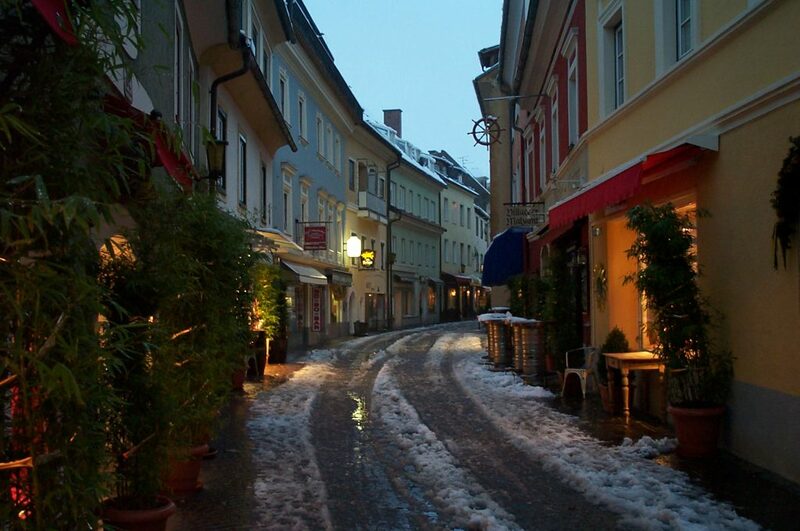 For those looking for a quiet getaway location, Villach seems like a great place to go. Small, bustling, yet quite and gentile, it was an enjoyable place to go on a cold, snowy afternoon on the way south. There is always the chance I’ll get back there in the summer time.